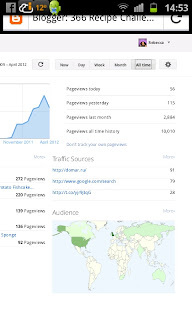 Firstly, I would like to take the opportunity to say thank you to all my readers for helping me make it to 10,000 page views in just over six months. I am amazed and humbled that people have spent time reading my words. I never thought in my wildest dreams that anyone other than my mother* and my lovely cousin Laura would read it. 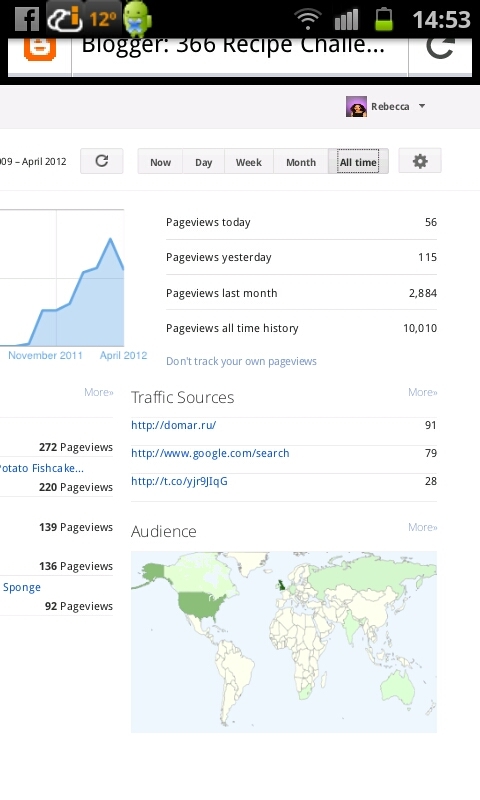 But to reach 10,000 page views in such a short space of time has made me all warm and fuzzy inside. So a huge thank you to everyone who has read, commented and tweeted me about it. It's been fun and you've all kept me going. And given me a reason to see it through to the bitter end in late September. I would love to name everyone who I know has taken the time to read, but I'm bound to miss someone out. Don't take offence if I do, but in no particular order thanks to Laura B, Tamara, Chantelle, Pauls L and W, both Kate S's, Dicky, Robs A, B and C, Hubby (for letting me pick on him), Paul L, Phil, Nelly, Sadia, Jaime, @UnderTheBlueGum, Amy (@WeeklyBakeOff), Laura (@Philosophobia), both Jules', Lisa, Allison, Alison (yes one has one 'l' and the other has two), Ewan who is letting me join his Olympic challenge (more about that on another day) and to all the people who have had cake foisted on them when I've had a baking frenzy. Anyway, on to today's recipe. Despite living in a 'Market Town' we don't actually have a proper market. There are a few token stalls strewn down the high street on a Saturday - most selling tat, the with a couple of local producers selling cake and a few veg - but nothing to allow you to stock up. Driving home midweek and in need of just one chilli I was sulking to myself that I'd be forced to buy an entire packet that I'd either have to use or would end up rotting slowly in the fridge. That's the trouble with generally cooking for one. Or cooking for three - but cooking three separate meals. I stopped in Morrisons for some odds and ends and was amazed to see that the latest revamp has turned the fruit and veg section into a proper market place where you can actually buy small quantities of things. And most stuff is loose. Meaning if you want one chilli, you can spend 8p (as I did) rather than 65p on pre-packaged ones that will go to waste. I got overly excited by the fact that you can buy all manner of exotic things which will be great for some recipes on this blog over the remaining months. So having fallen out big style with Ocado, I gave up my blessed Friday afternoon off this week in favour of doing my shopping myself and buying exactly what I need with minimal waste on both food and packaging. See David Cameron, I'm doing my bit. The most exciting bit is that they sell loose exotic mushrooms so expect many mushroom based recipes in the coming weeks. 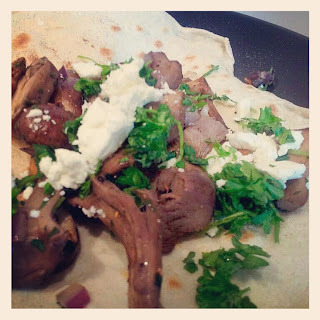 I have always loved mushrooms and can't believe so many of my friends don't share my passion. At one point, I was surrounded by so many mushroom-fearing that like a parched man in the desert, I literally jumped on the husband (he was not even boyfriend back then) like he would be my foodie saviour. Desperation leads to hasty assumptions. Hindsight is a wonderful thing. I'd had a few rubbish relationships around this time so with a good friend, came up with a list of ten criteria that any new beau had to meet. Liking mushrooms was on the list. The list became my dating yardstick and the husband was the only one who ticked all ten boxes. Cooked mushrooms taste better than they look! Anyhow, although he's not being subjected to experimental mushroom-ness tonight, tea tomorrow will also contain exotic mushrooms (see no waste here now). Like my mother, tea for him must contain meat, so I chose a recipe that would allow me to share part of the meal and for him to have chicken. Thomasina Miers has a section in her book (Mexican Food Made Easy) about tacos and different fillings for each season. I made the summer ones early on in this challenge. The spring one is mushroom based so I gave this a whirl to great success. Instead of using her taco recipe, I made Dan Lepard's corn oil tortillas. The dough is pretty similar and I really should've just made a few smaller ones to replicate a taco - but I'm greedy so went for two bigger wraps. As for the taste. It sounds weird, but it was just like eating a spring woodland, in the nicest possible way! 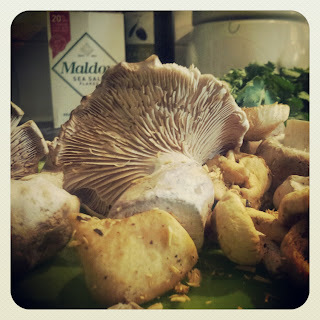 The mushrooms - being proper mushrooms than bog standard white button mushrooms - had an amazing earthy taste. I had a mix of Pied Bleu, Shitake and regular chestnut. And despite having probably sat on a shelf in Morrisons for a day or two, they tasted like they were freshly picked. I've picked mushrooms in the past with an expert, but wouldn't be brave enough to do so myself. With a liberal sprinkling of parsley and coriander in place of the tarragon, the flavour was lifted with a kind of fresh, grassy flavour. And the saltiness of the feta (Miers recommends this if you can't get Pecorino) gave it a depth that seasoning alone couldn't achieve. If I could afford to buy piles of these mushrooms (the Pied Bleu were something ridiculous like £30/kg), I'd eat this dish time and again. As always, top marks to Thomasina and also to Dan for the tortillas. These I now make regularly as it's far less stressful than trying to open a packet of shop-bought ones and a darn sight tastier too. Sadly, the recipe for the tortillas still isn't online but it's just another reason to buy the book. But they do get rave reviews from lots of the lovely people I Tweet with. 1. Heat half the butter and olive oil in a frying pan and add the mushrooms, seasoning with salt and pepper. 2. Cook over a high heat until the mushrooms have released their juices and the juice has started to evaporate, about 10 minutes. Add the rest of the butter and the oil (including the truffle oil if you are using it), the shallots and garlic and cook until soft. Sprinkle with the tarragon and check the seasoning. 3. 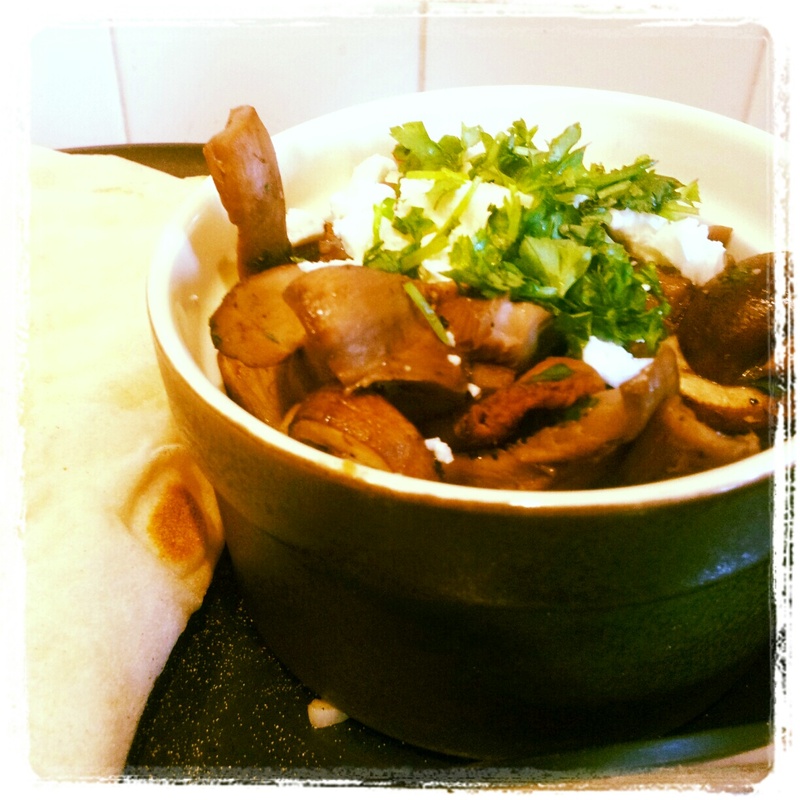 Spoon the mushrooms into a heated earthenware dish that will look fun on the table and sprinkle over the parsley and cheese. This is incredibly delicious with my sweet chipotle paste, but also yummy with the Fresh tomato salsa on page 26 and a dollop of crème fraîche. *My mother doesn't have time to read my blog apparently. She'd much rather spend her time playing Cityville on Facebook.